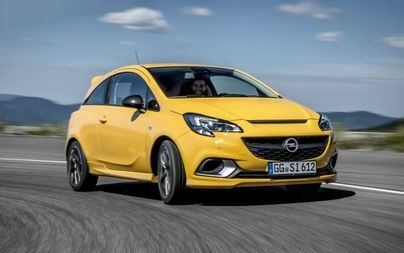 ﻿The eagerly-awaited new Opel Corsa GSi has arrived! After the Insignia, the Corsa is the second GSi model now on offer. The newcomer impresses with its ultra-precise OPC chassis – for exemplary handling and short braking distances. The Corsa GSi is powered by Opel’s lively 1.4-liter turbo with 110 kW/150 hp and 220 Nm of torque (fuel consumption l/100 km: 8.0-7.7 urban, 5.5-5.1 extra-urban, 6.4-6.0 combined, CO2 g/km 147-138 combined). The four-cylinder power unit features a special GSi-calibration for increased responsiveness. Mated to a short-ratio, six-speed gearbox, the engine delivers outstanding punch in second and third gears, as well as a maximum torque plateau from 3,000 to 4,500 rpm. The “hot hatch” from Rüsselsheim is therefore very quick off the mark (zero to 100 km/h is covered in only 8.9 seconds) and impresses with great elasticity: it takes just 9.9 seconds to accelerate from 80 to 120 km/h in fifth gear. Top speed is 207 km/h. The sporty Corsa GSi will be available to order from late 2018 and is expected to be priced at approximately €25,000 (TBC).